The focal, the flat teardrops, and the tiny nuggets in the fringe and in the double strand are all apple green chalk turquoise. 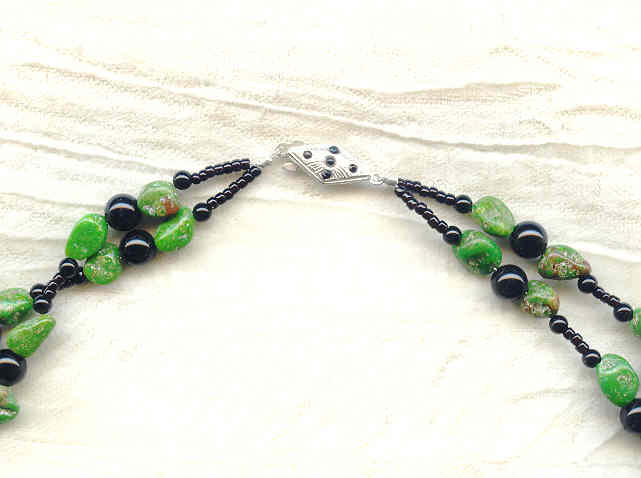 To that I've added a wealth of highly polished black onyx, and black glass seed beads. 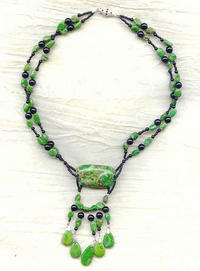 The 17" strand closes with a vintage sterling silver safety clasp with tiny dots of black glass adhered to it. The longest fringe element ends about 3" below the focal. It's a glorious combination of colour and textures. When drama is your watchword, you need look no further than SPARKLE PLENTY. 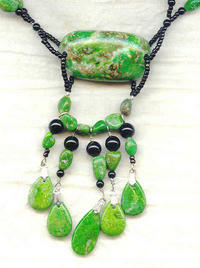 So-called 'African turquoise' is not turquoise at all, but a form of jasper. Broadly faceted moukaite nuggets and bright green mojave turquoise beads make this casual collar necklace a delight to the eye.